The Polar Bear is found in all of the polar regions of the entire northern hemisphere. This includes Russia, Norway, Greenland, the United States and Canada. Preferred habitat is in the area where the northern seas meet the shoreline. This area is continually crisscrossed with fingerlets of open water (leads) where a constant freezing and thawing of the ice occurs. This habitat is also preferred by the seal, a favorite prey of the polar bear. 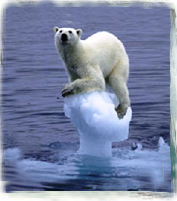 Current estimates put the polar bear population between 20,000 and 40,000. Of this, it is estimated that approximately 15,000 of the bears live in the Canadian arctic archipelago and the Hudson Bay-James Bay region. Generally, adult polar bears stand 3 1/2 feet tall when on all fours and have a body length from nose to tail of 8 1/4 to 111/2 feet. Females typically weigh around 660 pounds while the male weighs in 1100 to 1300 pounds although both can grow much larger. While the skin of the polar bear is actually black they are covered with a heavy fur that varies in color from pure white to more of a yellow hue. White fur acts as camouflage for the bears as they hunt out on the ice pack. On land the polar bear is not as quick as their close relative, the brown/grizzly bear (it is believed that polar bears are direct descendants of brown bears). They are, however, able to attain speeds of 25 miles per hour for short distances. They have extremely massive forelegs which are used to break through seal dens or flip a large seal our of the water. The forepaws of the polar bear are very large and with partial webbing between their toes they are able to use their front feet much like paddles to propel them rapidly through the water. Their hind feet are slightly smaller. Both the front and hind feet are covered on the bottom with dense fur affording them better traction when moving on ice. Polar bears are very capable swimmers (Ursus Maritimus means “sea bear”) and in the water they can swim at speeds of approximately 6 miles per hour for distances greater than 60 miles without a pause or rest. They are able to dive to a depth of 15 feet and remain submerged for up to two minutes. They have been observed leaping out of the water up to 8 feet in the air to surprise seals resting on ice flows. Being almost exclusive meat eaters, polar bears can go weeks between meals, although if available they will kill a seal every few days. Their diet consists mostly of marine mammals (ringed seals, bearded seals and a walrus pup now and then). The large capacity of their stomachs allow them to take advantage of unexpected large meals that will hold them over during the leaner times. When stranded on land during the summer and early fall the bears will subsidize their diet to minimize weight loss by scavenging the shoreline and a short distance inland for washed up carrion, bird eggs, rodents, berries and other edibles. 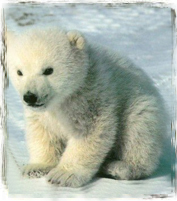 Pregnant polar bear females are the only polar bears who will enter a winter den and hibernate for any length of time. 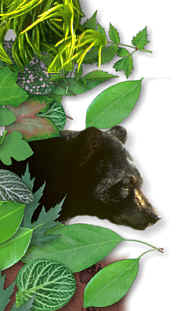 Other bears, to avoid or overcome an extremely severe winter storm or to avoid summer heat and insects, will build a temporary shelter. It is not uncommon for a female polar bear with new born cubs to lose as much as 40% of her weight while hibernating. Thus, she will try to put on as much reserve fat as possible before hibernating to help bring her embryos to term and then nurse the newborn cubs until leaving the den where she is once more able to eat. While hibernating the bear’s heart rate will drop from between forty to seventy beats per minute to only eight to twelve beats per minute. Metabolism slows down by half. The female bears normally become sexually mature in their fifth or sixth year, males in their eighth year. Mating usually occurs out on the pack ice between late March and mid-July. Females will mate with a number of males over the three weeks or so of the breeding season. After mating a process referred to as delayed implantation takes place. The fertilized ovum divides a few times and then floats free within the uterus for about six months with its development arrested. Sometime around September the embryo will attach itself to the uterine wall and resume its development. The mother will enter the den in October or November and the cubs are born sometime in December or January while the mother is hibernating. The delayed implantation process insures that the mother bear has enough fat reserves to carry her through the winter and if this is not the case the embryo will not implant but is simply reabsorbed by her body. She will then continue her winter hunting out on the pack ice. Females do not come into estrus when they are nursing cubs. The number of cubs born normally ranges from one to four with two cubs being average. At birth the cubs are blind, toothless, hairless and very tiny. They weigh from 21 to 25 ounces. In the next several weeks after birth the cubs develop rapidly while nursing on their mother’s calorie rich milk and will be able to follow their mother when she leaves the den. The life span of polar bears in the wild can be twenty-five years or more. Polar Bears are great roamers and have enormous home ranges. They cover very long distances and it is estimated that, in its lifetime, and individual bear may cover an area equal to 100,000 square miles in its constant search for seals. They do not defend their home ranges from other bears and it is normal for the home ranges of individual bears to overlap each other.